MMU - Dome Puzzle Pattern Gold Wedding Ring With its intricate puzzle detailing and modern dome shape design, this Pattern Gold Wedding Ring is a stunning piece of jewellery with more than a hint of Madani’s signature style. Beautifully handcrafted, it features a classic dome shaped band and a gold insert with puzzle pattern detailing. Both the band and the insert are available in white and yellow gold, and 10kt, 14kt and 18kt options. Personalise the inside with our engraving service. With its intricate puzzle detailing and modern dome shape design, this Pattern Gold Wedding Ring is a stunning piece of jewellery with more than a hint of Madani’s signature style. Beautifully handcrafted, it features a classic dome shaped band and a gold insert with puzzle pattern detailing. 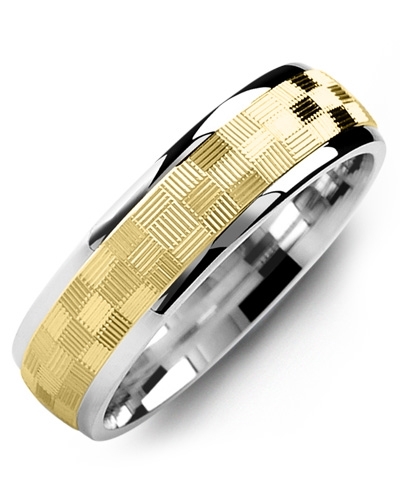 Both the band and the insert are available in white and yellow gold, and 10kt, 14kt and 18kt options. Personalise the inside with our engraving service.